Scent: Minty, slightly fruity aroma that is less bright than peppermint. Benefits, Indications: Bronchitis, candida, cystitis, hypertension. May balance and increase metabolism, may aid glandular, nervous and respiratory systems. 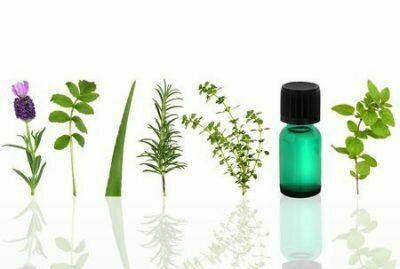 May help with acne, stimulate a poor appetite, help bad breath, promote easier labor in childbirth, help with depression, digestion, dry skin, eczema, headaches, intestines (soothes), menstruation (to slow heavy periods), nausea, sore gums, vaginitis, excess weight. When your mind is tired and in need of stimulation and uplifting, spearmint oil is the one for you, and although it has very many properties in common to that of peppermint oil, it contains only small amounts of menthol and is far less harsh on the skin and ideal for use in children. It is very useful to deal with digestive problems including flatulence, constipation, diarrhea and nausea, as it relaxes the stomach muscles and also relieves hiccups. Furthermore, it helps with headaches, migraines, nervous strain, fatigue and stress, as well as for the respiratory tract; helping with asthma, bronchitis, catarrh and sinusitis. On the skin it can relieve the itching of pruritus and helps with acne, dermatitis, congested skin and sore gums. For female health it can help to stem the flow of heavy periods and leucorrhoea and releases urine retention. Synergistic antimicrobial activities of essential oil vapours against Penicillium corylophilum on a laboratory medium and beef jerky.